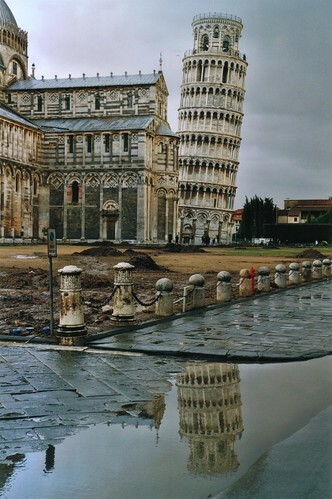 Pisa, the city of the Leaning Tower, is located northwest of Siena, directly west of Florence. In the 12th Century, when Flor­ence was still caught in the upheaval of the Middle Ages, Pisa was at her apex. Situat­ed on the banks of the Arno just 12 km (7.5 miles) from the Ligurian Sea, the city was a maj or trading capital, with close ties to ports in the Middle East and beyond. But Pisa's heyday was to last only a brief moment; by 1300 the younger, more vital cities of the region had begun to pass her by. Nature was no less unkind: in the 15th Century Pisa's harbor filled with silt, and the once bustling port became barely navigable. Although it remained a commercial center, Pisa's glory days were over. Nearly five and a half centuries later came the crudest blow: massive destruc­tion during World War Two. Fortunately, the centerpiece of Pisan culture, the spectacular Piazza del Duomo, remains intact. Also known as the Campo dei Miracoli, or the Field of Miracles, it is exactly that: a magnificent cluster of white marble religious buildings whose "Pisan style" incorporates both the Euro­pean and Eastern architectures which Pisan merchants and sailors were exposed to during their travels. Nowhere is that influence more ob­vious than in the Duomo. It was the first cathedral in Tuscany to use the dark and white striped marble facade, a pattern copied in dozens of the region's other churches. As you enter, linger at the bronze doors, which depict scenes from the life of Christ and the Holy Virgin. Inside, the pattern of the facade is con­tinued, soaring skyward to a spectacular royal blue and gilt ceiling. The cathedral contains two important works of art: Giovanni Pisano's intricate pulpit, and, to the right of the chancel, Andrea del Sar-to's Saint Agnes. Directly in front of the Duomo is the Baptistry, which contains Nicola Pisa­no's lovely pulpit. To the left is the Camp-osanto, or holy field. Don't neglect to visit this walled cemetery; as legend has it, the earth for the burial ground was brought back by crusaders from the Hill of Calvary.Then, of course, there is the Campanile, better known as the Leaning Tower. As you can see from the top of the tower, much of the rest of the city is of post-war vintage. The area around the Piazza del Duomo has one of the largest collections of tourist gewgaw stands anywhere in Tus­cany. Unless you're in the market for a model of the leaning tower.